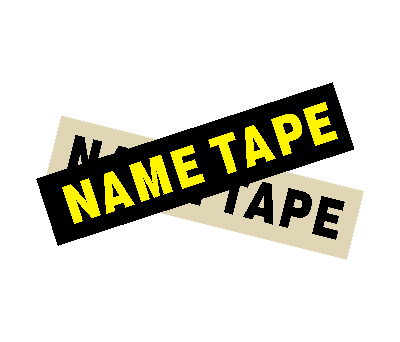 NAME TAPES 5.25" X 1"
Pricing is for the total number of patches ordered with the same combination. VINYL LETTERS ON MAGIC BLACK 5 1/4"x 1"
Vinyl on Magic Black. Covert, will not reflect in the visible spectrum. Black areas Reflect brightly when viewed with night vision equipment. 5 1/4"X1" with Velcro backing. METALLIC VINYL ON MAGIC BLACK 5.25"x1"
Pricing is for metallic silver or gold on Magic Black. 5.25"X1" with Velcro backing. You can select a combination of background, and color, for your patches. Examples above are only a guide. VINYL LETTERS ON RAW SOLAS 5 1/4"x1"
Black Vinyl lettering on Raw Solas. Non-covert, white areas will reflect in the visible spectrum. Pricing is for one color on raw SOLAS 5 1/4"X 1" with Velcro backing.